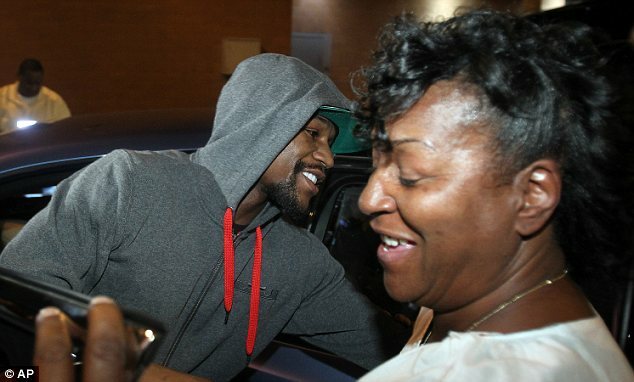 Undefeated Boxing champion, Floyd Mayweather walked free from a Las Vegas jail early on Friday morning after serving two months for battering his ex-girlfriend in front of their children. The undefeated five-division champion was greeted by 20 family and friends, including rapper 50 Cent, as he emerged from Clark County Detention Centre just after midnight. The 35-year-old remained silent as, in the darkness, he got into a blue Bentley sedan and drove himself away. He had served two of the three months jail time he was handed for a hair-pulling, arm-twisting attack on former lover Josie Harris as two of their three children watched. And he is now free to resume a boxing career his lawyers warned in court documents might be at risk because jail food and water did not meet his dietary needs. They also said his lack of exercise space in a cramped cell of fewer than 98sq ft threatened his health and fitness. 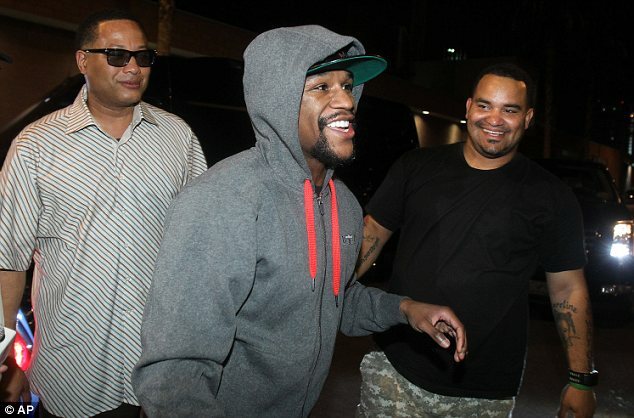 A lot has happened in Mayweather's world since he was jailed June 1. 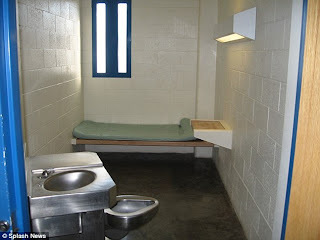 With no television in his solo cell, he could not see arch rival Manny Pacquiao lose his WBO welterweight title on June 9 to Timothy Bradley. Mayweather, who goes by the nickname 'Money', was also not around to celebrate last month when Forbes magazine named him the world's highest-paid athlete for 2011. And he missed fiancee Shantel Jackson's private birthday bash last week at a Las Vegas steakhouse with friends and Las Vegas Review-Journal celebrity columnist Norm Clark noted that Mayweather sent diamonds. Promoters for Mayweather's main rival, Philippine boxer Manny Pacquiao, are planning a fight for November 10 at the MGM Grand Garden arena in Las Vegas, Nevada Athletic Commission executive Keith Kizer said. Pacquiao's opponent has not been named but Mayweather was not believed to be on the list. Pacquiao, who earned $62million in fights and endorsements last year, ranked second on the Forbes richest athletes list behind Mayweather and his $85million in fight earnings. To fight in Las Vegas, Mayweather will need a new license from the Nevada Athletic Commission, Kizer said yesterday. His last license, for the May 5 bout against Miguel Cotto, was for one fight only. If Mayweather applies, commission Chairman Raymond 'Skip' Avansino Jr could decide to grant approval administratively or summon Mayweather before the panel for a public hearing, Kizer said.